At BunchesDirect, we love to work with other bridal vendors and to bring you guest blogs that will assist you with your planning. This month we were pleased to receive a wonderful article from Best for Bride-Canada’s top bridal dress chain. We have added bridal bouquets to coordinate, from our Canadian company, BunchesDirect.ca, but these bouquets are also available in the U.S. and Australia. Coming soon, you will also be treated to a FREE $50 BunchesDirect gift card at any Best for Bride store, when you purchase your gown! 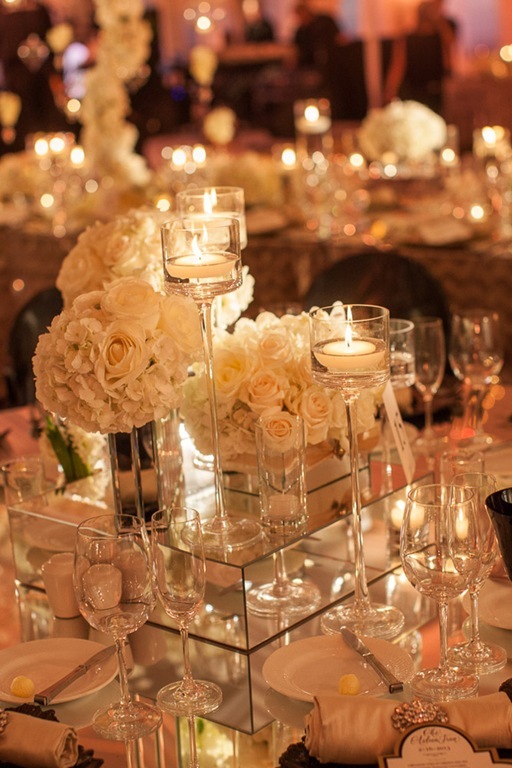 For now, please enjoy these great tips from Best for Bride! The bouquet is a very important accessory for your bridesmaids. So, you should pay attention to choosing the right shape, size and flowers in these bouquets, so they contribute to the overall wedding scenery. Best for Bride suggests that prospective brides keep the following factors in mind when choosing bridesmaids bouquets, so they come together beautifully and have maximum visual impact. You may be tempted to match the flowers to the dress color you picked for your bridesmaids. This may not be a good idea as flowers of the exact color will be lost in the background of the dress. The better option is to choose flowers that are a few shades darker or lighter than the dress color. If you do not want a monochromatic bouquet, the options are endless. Look to the color wheel for inspiration.When your chosen flowers and bridesmaid dress color are opposite to each other on the color wheel, the contrasting combination will make them pop. Using complimentary colors that are close to each other, like blue and green or yellow and orange, will create a relaxed effect. The bouquet shape and size should reflect the style of the dress. Snug-fitting, well shaped gowns look best with small, sleek bouquets, while layered dresses with volume go well with round bouquets. Also balance the colors and details in the bouquet to the dress design. For a simple dress, you can use more colors in the bouquet. However, if the bridesmaid dress has details like prints, embellishments or waistbands, keep the bouquet simple so the overall look isn’t cluttered. Unless the bouquet size is proportionate to that of the bridesmaid holding it, it will not look good. If the women in your bridal party are of different sizes, you may like to match individual bouquets to the woman carrying it. A bouquet that is too large can be overwhelming on a small frame, while a tiny bouquet may not be the best accessory for a woman with a large frame. A medium-size bouquet would be better for the bigger women in your bridal party, while you can go with small ones for the rest of the group. Your bouquet and the bridesmaids bouquets should form a cohesive look. You can achieve this by choosing scaled-down versions of your own bouquet, for them. Or you can have a unifying element, like a matching accessory that ties it together. The other option is to fit the different bouquet designs to a single color or design theme that brings it all together. BunchesDirect has different sized bouquet options in the same group, in bridal, bridesmaids, flower girls, and even toss bouquet sizes, so it’s easy to create a cohesive look. BunchesDirect also has coordinating boutonnieres and corsages to complete the look. Author Bio: This article was brought to you by Best for Bride.com, Canada’s leading wedding dress chain and one-stop bridal destination. Best for Bride features a vast inventory of top-class designer wedding dress and bridesmaid dress collections, apart from bridal party dresses and accessories. They also offer a range of wedding services and a reliable online wedding shopping service. Mariah Carey announced her engagement on January 21 to mega-billionaire James Packer, and knowing Mariah’s over-the-top personality this wedding is looking to be bigger than some royal nuptials. According to RadarOnline.com, Mariah “wants it to be the most expensive wedding of all time,” in a celebration to rival that of Prince William and Kate Middleton. Packer proposed to her on her home turf of Long Island, New York. 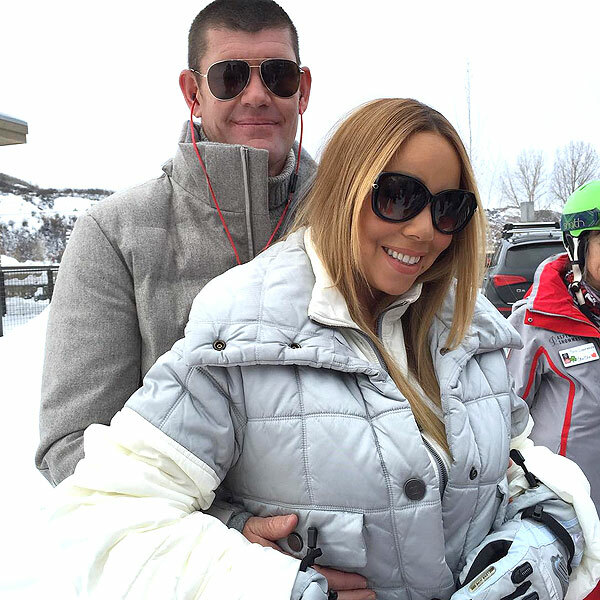 Other sources suggest that Mariah wants a summer wedding, and that boyfriend James is picking up the entire tab. Considering he is worth approximately $4.7B this is probably a fair plan. Her engagement ring is stunning: a massive diamond approximately 35 carats in size worth a reputed $8M, from jeweler Wilfredo Rosado. The pair have been dating since June 2015 and reportedly fell in love last summer when Mariah, 45, visited James, 48, on his super yacht, Arctic P., off the coast of France. The couple spent Christmas vacation in Aspen and enjoyed time with Mariah’s four-year-old twins Moroccan and Monroe, her children with former hubby Nick Cannon. New rumors are now circulating that the pricey pair want to be married in Australia, where casino-owner Packer is from, or else in the south of France. to pay homage to where they met. (These are the kinds of problems to have!). Packer hails from a media mogul family and is reputed to be one of the richest men in the country. There is little doubt that wherever the couple decides to wed, Mariah will hire the best wedding planners and expect top service and a spectacular event. Even in her first wedding, to Sony exec Tommy Monroe, she spent a reported half million, which translates to abuot $800k in today’s dollars. We can only imagine the virtually unlimited budget she has for this wedding. According to the latest sources, Mariah wants thousands of white roses and lots of bling at the event. White roses are always a stunning choice! If you love white roses but don’t happen to have a billionaire budget, BunchesDirect has lots of options for you. For even more savings, consider a BunchesDirect wedding package! The White Rose package will give you an Elegant Rose bridal bouquet, 2 bridesmaid bouquets, 1 toss/flowergirl bouquet, 3 Divine Rose boutonnieres , 2 Belle White Rose corsages, and a package of beautiful fresh rose petals (approx. 400). This could be your dream wedding in one easy purchase! We wish Mariah and James all the best. We also look forward to helping YOU achieve your own dream wedding! Visit the website for even more white rose bouquets, corsages, boutonnieres, centerpieces and cake toppers. The holidays are always a popular time for engagements, and celebrities are no different than many of us in choosing to pop the big question during cherished times of friends, family and relaxation. As we welcome the new year, we are excited to take a look at the many celebs who are newly engaged, and pick out a perfect wedding bouquet for each. Read on! Skylar Astin and Anna Camp, who play Jesse and Aubrey in the Pitch Perfect movies, announced their engagement via a very sweet post on Instagram. “I asked,” said Skylar, “She said yes!! !” We think the very lovely and elegant Anna would adore our BunchesDirect bouquet Pretty Woman. Audrina Patridge of The Hills became engaged to her longtime boyfriend Corey Bohan just before Christmas. Corey is a professional dirt bike rider and proposed to Audrina during a romantic dinner at the Summit House in California. For Audrina’s more eclectic style, we recommend a gorgeous and unique Warm Springs bouquet. Most sources agree that Ryan Phillippe, who most of us know as the ex of Reese Witherspoon and star of Dangerous Liasons and Secrets and Lies, proposed to his girlfriend Pauline Slagter over the holidays. The pair are said to have become engaged on Christmas Day, with Pauline’s gorgeous new bling on display when the couple lunched at Seaspice in Miami the Sunday after. Pauline is about to graduate from Standford law school, so this beauty definitely boasts brains as well. For this smart and youthful bride, our pick is a beautiful Hint of Purple bridal bouquet. Age is no barrier to romance! 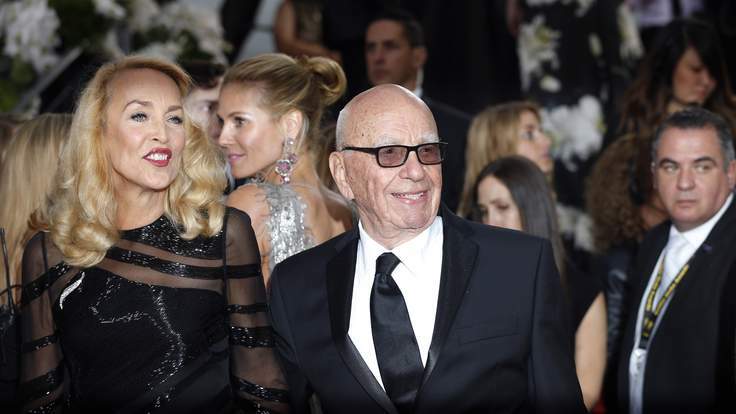 Media mogul Rupert Murdoch, just became engaged to former supermodel, and former wife of Mick Jagger, Jerry Hall over the past weekend. Murdoch is 84 and this will be his fourth marriage; Jerry is 59. The engagement reportedly happened in Los Angeles where the couple attended the Golden Globe Awards. For this former wild child and model, now a refined mature beauty, we recommend the elegant Dreamy Cloud bouquet. Actor Jason Statham, 48, popped the question and provided some major diamond wattage to former Victoria Secret model and Mad Max actress Rosie Huntington-Whiteley, 28, during the Golden Globes weekend. Whiteley showed off her gorgeous new ring along with her Atelier Versace gown at the awards ceremony. The ring is reported to have a stunning $350,000 price tag! We think the stunning BunchesDirect bouquet Pink Cluster would also be very pleasing to this gorgeous bride! If you’ve selected red bridesmaid dresses, you are not afraid to make a glorious statement. 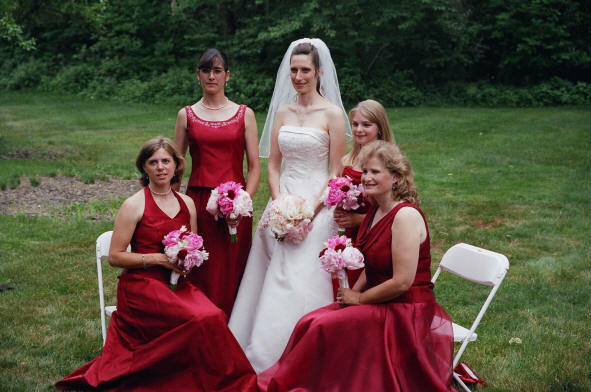 Red bridesmaid dresses provide a rich hit of color to any wedding party. They are especially gorgeous for a fall or winter event, but can work beautifully in any season. These saturated hues can work with a variety of complexions and hair shades— just adjust the shade of red accordingly—and they will always help set off the bride due to the high contrast with her traditionally pale gown. Select the perfect bridal bouquets to complement this rich color of dress and you are sure to create a truly stunning presentation. You cannot go wrong with a choice of white or cream wedding flowers. The high contrast will set off the red dresses and is an especially lovely choice for a Christmas wedding. For added interest, you could also select a red bouquet for the bride to help set her apart and to continue the matched “red and white” theme. BunchesDirect bouquet suggestions: Classic White Carnation, Pretty in White, or Vintage White would be beautiful choices! Create a rich, dramatic effect by layering red on red. Choose all-red bouquets or red bouquets with small elements of white to add beautiful saturated color to your overall wedding scheme. 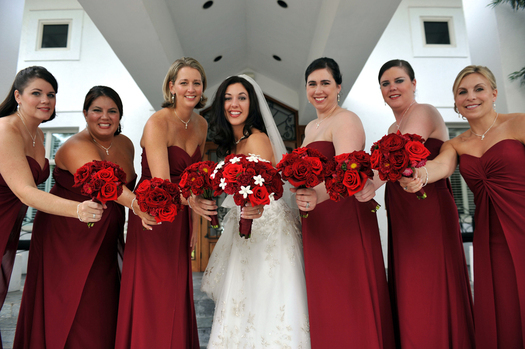 BunchesDirect bridal bouquet picks: Crimson Dream, or Romantic Red. If you are not afraid of colour, go vivid and bold by choosing bridal bouquets in shades of red and orange. This unexpected choice creates impact and warmth and can work especially well for summer weddings. BunchesDirect bouquet selections: Romantic Rush or Calla Lily Delight would provide beautiful richness to your palette. Choose bouquets that mix romantic and unexpected combinations of red and pink, to add a sweet, feminine vibe to your wedding palette. Forever Connecting by BunchesDirect s a stunning selection sure to give your wedding that pretty “wow” factor. Choosing bridal bouquets containing red and yellow flowers will add brightness to the color scheme, and provide a sophisticated and slightly less conventional take on things. This is a wonderful choice for a spring or summer event. Lasting Love from BunchesDirect would be a perfect choice!